This lamp was lent to me by Charles Tsai/Intelligent design cycles. I've tried it out from 1 August to ca. 20 August 2010. I didn't get round to do in depth testing of how annoying (or perhaps how good :) ) the rear lamp is when riding behind someone with such a lamp (at various distances). The short test I did do showed a ridiculous amount of light for a rear lamp (because of the frsted lens, it certainly doesn't get as bad as the front lamp when looking into it). This lamp is really meant for night-time mountainbiking, but again as with the Magicshine, I'm testing this to see what's possible on a dynamo with more LEDs and thus to experience more light with a dynamo and see if I can feel the power required (answer: not really) and whether there's a vibration issue at such power drawn from the dynamo hub (answer: again, not really). For more on this lamp, see the website of the maker http://www.cncdelite.com/ where you can order one too. You can also find more information on the forum of mtbr.com and on candlepowerforums.com. This lamp is fitted with a Carclo narrow lens. Despite this, the beam doesn't get very far. This is a general problem with the XP-G LED, there are no good lamps with it that have a good throw because of the broad beam the XP-G gives which is hard to bundle properly, well, with a small lens or reflector! I tried any angle to give me the best distance for illumination not worrying about blinding people as this lamp, just as the Magicshine, blinds oncoming traffic at just about any angle you point it anyway (most tests were done on roads without oncoming traffic). The result is quite disappointing at at best 40 m, quite a bit less than the Edelux. First impression on 1 August: Brighter than the Magicshine, even distribution of light, but in comparison, the Philips LED bike light rocks (the Edelux, triple XP-G and Philips lamp along with an old halogen lamp, the Lumotec oval senso plus, were all compared by me and Charles Tsai on 1 August on an almost entirely unlit road). The amount of spill light with the Ktronik lamp is enormous, but there's not so much light directly next to the bike. The Magicshine has a very bright ring of light close by, which gives you more the impression of riding in daylight than the Ktronik lamp, because buildings, trees etc. that are almost right beside you are fully lit up. 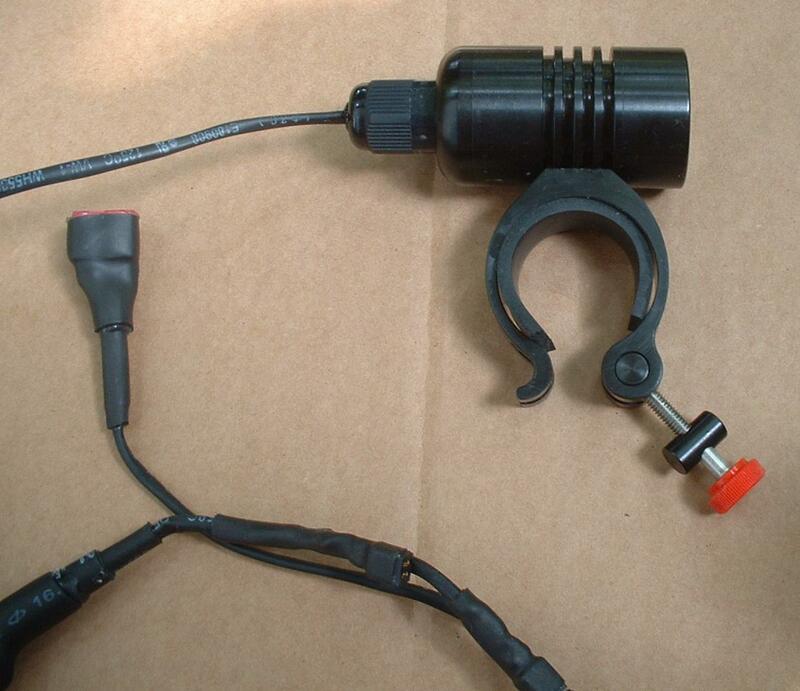 I'm not saying this is good or bad, it's just an impression (it may or may not be relevant to mountainbiking in the dark, and for on-road use both lamps are really not suitable, dangerous even, so this impression is not an argument for or against either lamp). A further impression is that this lamp has a more even distribution than the Magicshine, that is around Edelux level for close range (at larger distance, ca. 30m or more, the Edelux is better) even when pointed to give maximum throw on the road. It appears not to give much more vibration than an Edelux (the dynamo hub must produce ca. 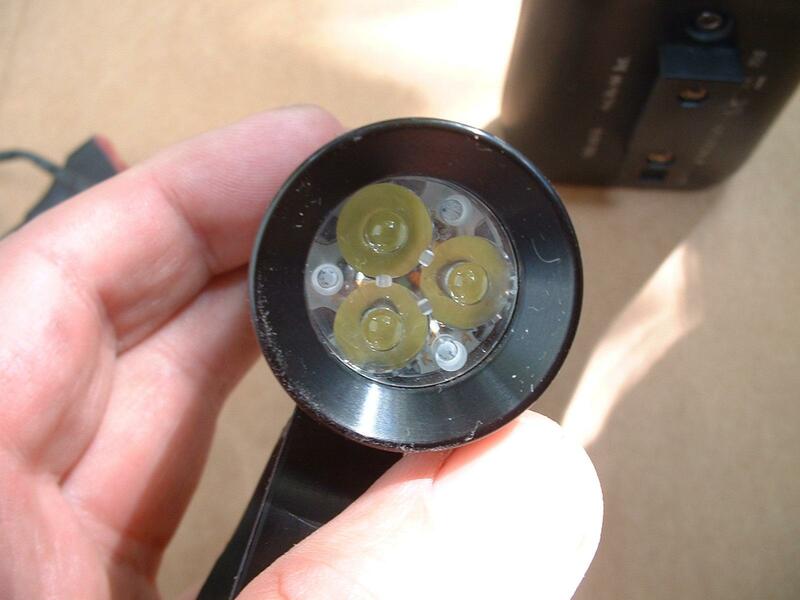 7 Watt for the 3 LEDs instead of ca. 2.4W for the Edelux), so that's excellent as I was worried a 3 LED lamp might be irritating because of much stronger vibrations. I've tested this with another bike (different fork/tyre mass etc.) and it didn't seem to be a problem there either. Amount of light: Assuming with the right tuning capacitors for the speed you want most light at (there are various tuning caps included in setup as I tested it), you coax 0.70 A out of the dynamo hub, each XP-G should produce about 210 lumen (see http://www.mtb-news.de/forum/showpost.php?p=6822716&postcount=1088). 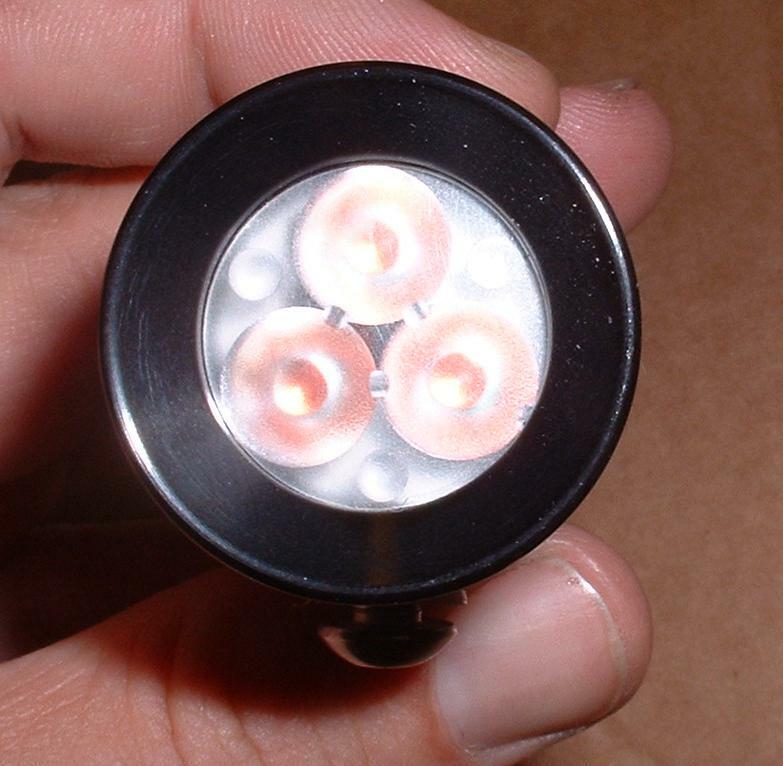 So the triple probably produces about 630 lumen minus optical losses, which are usually 0.10x to 0.15x. 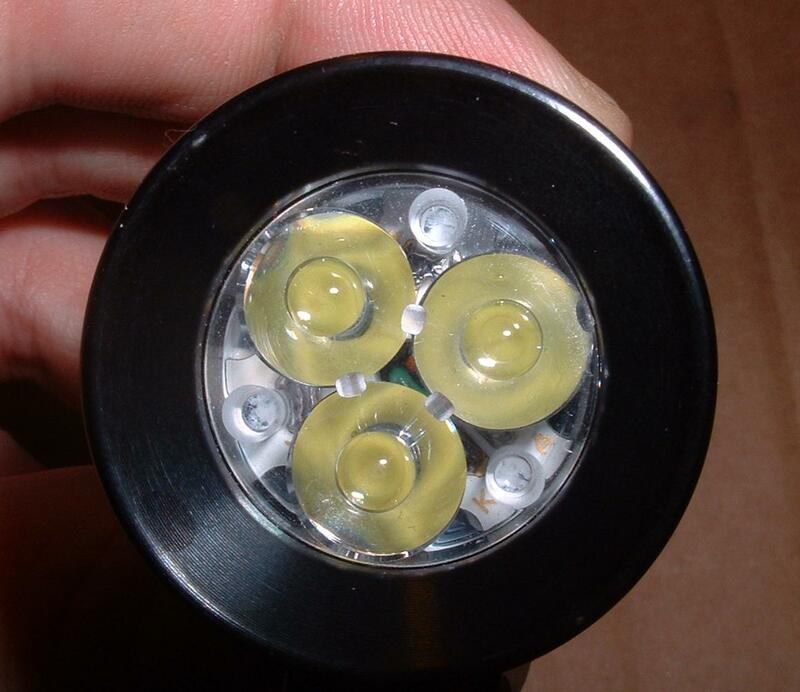 So I expect output to be around 550 lumen, about the same as the Magicshine. 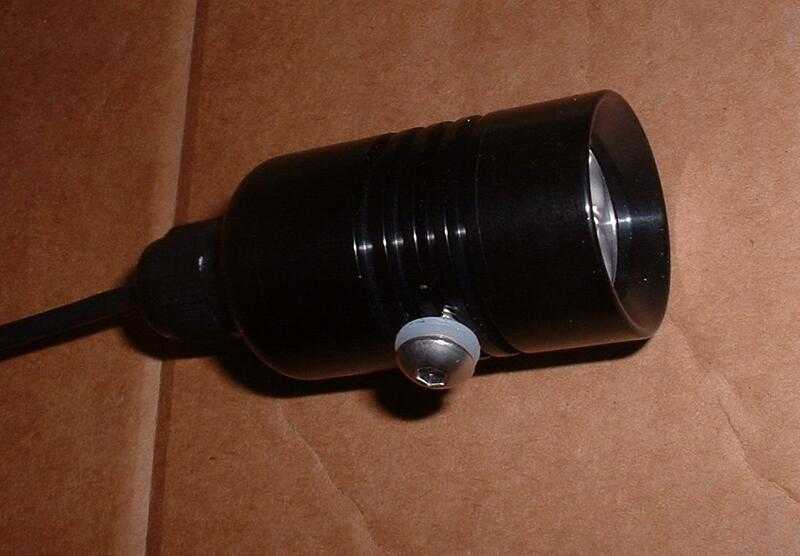 Because of the wide angle of the light, probably about 0.60 of that (330 lumen) will get onto the road (i.e. below the horizon) and of course not all will come on the ground where it's useful (10 metre to the side for example, or really far away), so effectively there will be even less useful light on the road. I first got the impression the triple XP-G was brighter than the Magicshine because of the even light distribution die lights up the road more at medium distances (say about 5 to 10 m from your front wheel), but the Magicshine has a brighter ring of light near you, and a brighter hotspot. Shows what's possible with 3 power LEDs on a dynamo, i.e. it gives a huge amount of light. For on-road purposes this lamp is not suited: it's dangerous for oncoming cyclists on unlit roads although because of the more even beam it's not as bad as the Magicshine, and elsewhere it gives a lot of annoyance to oncoming traffic and pedestrians. If you want to ride mountain bike (or need headlamps in a countries where drivers in cars are trying to kill you! ;-)), then this is a great setup that will give you much more light than Supernova's rather pathetic dynamo powered offerings.